Access mode: the Presidential Library's online portal. Systems. Requirements: 1 GHz PC or higher; RAM 512 MB or higher; Windows OS; Windows Media Player; video adapter; stars map. Duration: 4 min. 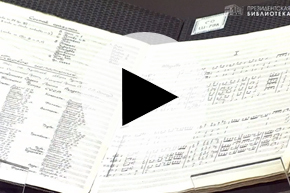 33 s.
The video tells about the transfer of the Presidential Library by St. Petersburg House of the Presidential Library to digitize the score of Dmitry Shostakovich's 7th symphony, which was used to perform this work in besieged Leningrad . I. Sennikova, Yaroslava Valeryevna. Ii. Yarosh, Vladimir Mikhailovich. Iii. Raytsev, Nikolai Yakovlevich. Iv. Osin, Andrey Alekseevich. V. Furmanova, Yulia Nikolaevna. Vi. Stanyakin, Anatoly Petrovich. VII. Presidential Library (St. Petersburg) .1. Presidential Library (St. Petersburg, city) - Events - 2018 - Multimedia publications. 2. Symphony. 7 - Multimedia publications. Shostakovich, Dmitry Dmitrievich (1906 - 1975). 3. The people (collection). 4. Russia in the faces (collection). 5. The memory of the Great Victory (collection). 6. Siege of Leningrad - 1941 - 1944 - Multimedia publications.